Despite another loss by U.S. Open champion Sloane Stephens, the United States won its first Fed Cup title in 17 years today. With the U.S. and host Belarus tied 2-2 after singles, Shelby Rogers and CoCo Vandeweghe defeated Aryna Sabalenka and Aliaksandra Sasnovich 6-3, 7-6 (3) in the deciding match in Minsk. It was the Americans' 18th Fed Cup title, more than any other country. Next is the Czech Republic with 10. 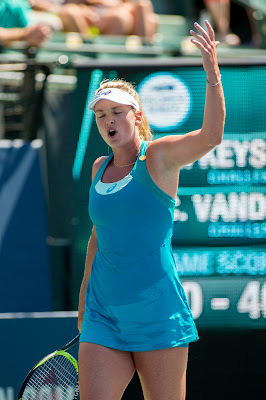 Vandeweghe, who cracked the top 10 in the world for the first time in the year-end rankings at No. 10, gave the United States a 2-1 lead in the two-day competition with a 7-6 (5) 6-1 victory over Sabalenka, ranked No. 78 at 19 years old. Vandeweghe, a two-time runner-up in the Bank of the West Classic final at Stanford (2012 and this year), trailed 1-4 in the tiebreaker. Sasnovich, ranked 87th, then edged the 13th-ranked Stephens 4-6, 6-1, 8-6 to set up the deciding doubles match. Stephens, who grew up in Fresno, is 0-6 since defeating countrywoman Madison Keys in September for her first Grand Slam title. "I'm just really thrilled for all four players (including Alison Riske, who did not play)," Kathy Rinaldi, who completed her first year as the U.S. Fed Cup captain, told reporters. "CoCo came out and just played unbelievable, Shelby stepped up, and Sloane -- my heart was broken for her, but she battled the whole weekend. She battled all the way to the end. I'm so proud of all four of them." Vandeweghe, 25, became the first player to win eight Fed Cup matches in a year since the current format began in 2005 and the first to win the maximum six singles matches since Petra Kvitova of the Czech Republic in 2011. "It was a lot of work and a lot of dedication to the Fed Cup in each and every round," Vandeweghe said. "I dedicated my time and energy through my season to be able to perform the best I could for Team USA." Both teams were missing star players this weekend. For the United States, Serena Williams is on maternity leave, 37-year-old Venus Williams skipped the Fed Cup this year, Keys cited a wrist injury, and doubles specialist Bethanie Mattek-Sands is recovering from knee surgery. Belarus' Victoria Azarenka has child custody issues that also caused her to miss the U.S. Open.